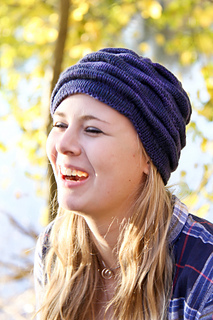 A soft and highly textured hat, Ruckle features a hemmed brim and three dimensional allover tucks. 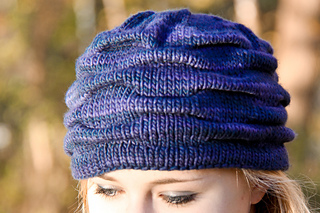 The ruckles are fun to knit and fanciful to wear, and add an original flair to any outfit. 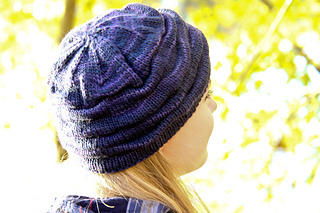 For a fun and matched set, look for the companion Ruckle Hat and Mitts. 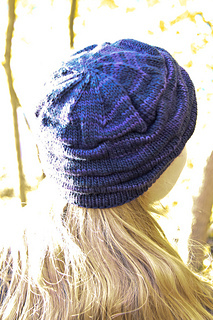 knitting in the round; this pattern includes written instructions, as well as a photo and video tutorial for the tuck stitch. Size: S (M, L) to fit approximately 20.5 (22.5, 24.5)” head circumference; 18.5 (21.25, 24)” circumference, 7.25 (8.5, 9.5)” depth, unstretched. Yarn: Malabrigo Merino Worsted (100% Merino Wool; 210 yards/100g); 1 skein. Size M shown in Paris Night. Other Materials: US 8 (5mm) dpns or 32” circular needle if using Magic Loop, or size to match gauge; Spare US 8 32” circular needle, for hemming brim; Stitch markers (10); Yarn needle; Smooth cotton yarn for provisional CO.